James A. Seymour and John E. McIntosh organized the McIntosh & Seymour Corporation in 1886. The company made high speed stationary steam and oil (diesel) engines for powering factories and ships. The company was later named ALCO. ALCO went through a number of owners before Bombardier purchased the company. The buildings still exist on Columbus Street. A son, James Sayre Seymour, married Natalie Dulles, daughter of Allen M. Dulles. 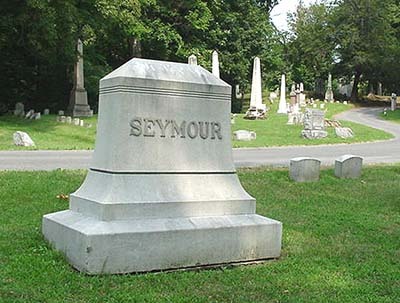 The Seymour monument is in the Cemetery's Morning Side section.